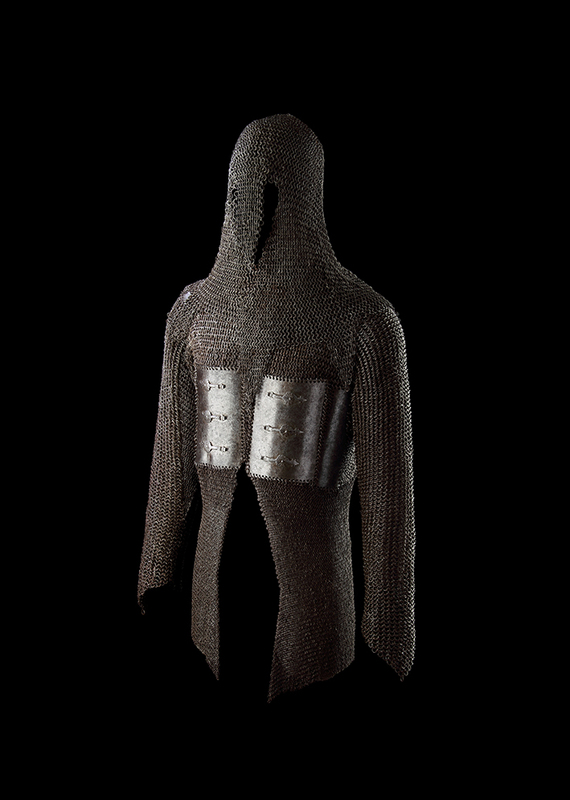 This chainmail coat is much heavier than most, comes to us from the late 16th or early 17th century, and was part of the famous armoury at Bikaner, Rajasthan. Rectangular iron plates, contoured to sit against the body, reinforce the chest, sides and back; with those on the front each having three buckles with lobed discs. The plates at the rear are smaller, laminated and arranged into columns in order to afford the wearer some degree of movement. A Devanagari inscription on the inside of the right ‘breast plate’ mentions the name of Maharajah Anup Singh of Bikaner (1669 to 1698) and records the fact that this shirt entered the Armoury when the Maharajah Anup Singh defeated the Adilshahi Dynasty at the Siege of Adoni in 1689. The front of the right breast plate has a short, neat inscription in Persian with the words Darwish Sahib—probably a reference to an important man to whom the shirt was presented after it entered the Armoury. The hood (or khula zirah) is particularly long with the dags (triangularly shaped tails) designed to fall across the shoulders, upper chest and back to add a further layer of protection to those vulnerable areas. The rings that comprise it meet at the very top where an iron disc resides.